If you look at bank stock valuations, it's pretty clear that we're still a long way from a bank stock bubble. It'd be easy to think that bank stocks are getting overheated given how much they've soared since the results of the presidential election were announced last week. However, investors needn't be concerned that bank stocks are approaching, or even getting near, bubble territory. As you can see, the KBW Bank Index very clearly diverged from the S&P 500 in the immediate aftermath of the presidential election. 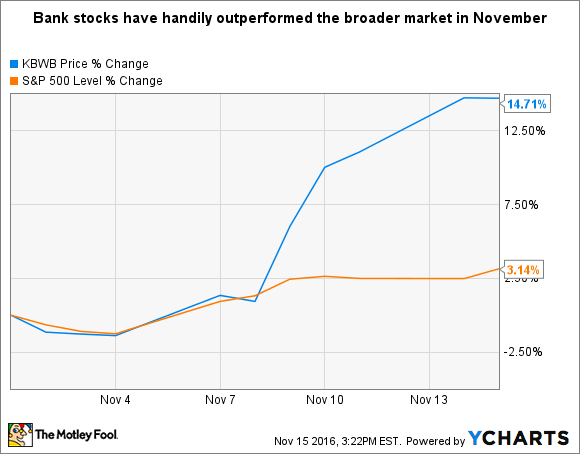 Since the beginning of November, the KBW Bank Index is up 14.6% compared to the S&P 500's 3.1% rise. Bank stocks are climbing on the back of President-elect Donald Trump's promise to revitalize the economy and reduce regulation in the financial industry. A stronger economy should boost loan demand, spur inflation, and presumably incentivize the Federal Reserve to raise interest rates. The latter in particular is enough on its own to move bank stocks. To this end, if interest rates were to increase by a mere 100 basis points, JPMorgan Chase (NYSE:JPM), Bank of America (NYSE:BAC), Citigroup (NYSE:C), and essentially every other bank would stand to earn a lot more money. Bank of America says its net interest income would rise by $5.3 billion in response to a 100-basis-point increase in both short- and long-term rates. JPMorgan Chase estimates that its net interest income would climb by $2.8 billion under the same scenario. And Citigroup forecasts a $2 billion boost to its net interest income if rates moved in this way. Rolling back regulations would catalyze these gains, with two rumored moves having a particularly potent impact. Getting rid of the Volcker Rule, which prohibits depository banks from trading like hedge funds, would spur earnings at all three of these banks. And reducing the amount of high quality, low-yielding liquid assets that a bank must hold would allow these companies to underwrite more high-yielding loans. But just because these changes have translated into higher bank stock prices doesn't mean that banks are anywhere near bubble territory. This is easy to deduce by looking at bank valuations, as a bubble implies irrationally inflated stock prices. To this end, Bank of America and Citigroup still trade for discounts to their respective book values -- Bank of America at 17% below its book value and Citigroup at 26% less than its book value. And while JPMorgan Chase and Wells Fargo trade for premiums to their respective book values, the premiums are patently reasonable. JPMorgan Chase's shares are priced at 24% above its book value and Wells Fargo's are 46% above its. Until bank stocks trade for more than two times book value, which is more than twice Wells Fargo's current premium, there's simply no reason to be even remotely concerned about irrationally inflated values. In short, bank stocks still seem to be reasonably priced.